How do I get replacement discs and books? If you would like a disc replaced or an extra workbook, please contact our Customer Service department through e-mail at: service@legacyinstruction.com (please be sure to include the item request in the subject line). Can I copy the DVDs? You cannot copy the DVDs due to copyright infringement. If you would like additional copies of certain discs, please contact our Customer Service department at 615-515-3605. Do your DVD's play on a MAC computer? YES! As our DVD's are video based, and not software or programming based, they should play on any standard DVD player, whether for a TV, computer (Mac or PC), and even gaming console that supports DVD playback. I have Windows 8 and I cannot get the discs to play in my computer. What do I do? Unlike previous version of Windows where you could play DVD's in Windows Media Player, Microsoft changed their platform to where this is no longer supported for Windows 8. You will need to download a third party program in order to play DVD's in Windows 8, if one does not already come with your computer. We recommend either the GOM Media Player found here: https://player.gomlab.com/eng/ or VLC Media Player found here: https://www.videolan.org/vlc/. Once you download and install either one of these players, the discs should play successfully. If I'm not in the US, can you convert my order to my country's currency? All of the dollar amounts shown on our website are in USD. Unfortunately we cannot convert the USD amount to a different currency. If you consult your local financial institution, they should be able to provide the most up to date exchange rate for you. I'm experiencing problems playing the discs on a PC...I'm getting a "regional encoding" error message. What do I do? Please follow the steps below to resolve the problem. 1. Go to https://www.free-codecs.com/download/AC3_Filter.htm in your Internet Explorer browser. 2. Click "Download AC3 Filter". *Note: ONLY click on the underlined link below the description: "Download AC3 Filter". 3. Click "Download [ AC3 Filter 1.11 final ]"
4. You will receive a prompt window asking if "you want to run or save this file?" Click on "Save", choose your desktop as the destination, and click "Save". 5. Once the file has finished, locate it on your desktop (the file name is "ac3filter_1_11") and double click on it. 6. You will receive a prompt window asking if "you want to run this software?" Click on "Run". 7. The next window will automatically pick the destination in which the filter should be saved to, proceed by clicking "Install". 8. Once the window says "Completed" at the top, click the "Close" button and your install is finished. 9. Insert your DVD and open Windows Media Player to view. *Note: You may need to restart your computer for the install to fully operate. I'm having trouble playing some of the sessions on my computer? What do I do? It has been brought to our attention that small number of discs will not play on every PC. This problem is limited, and only occurs on three specific discs for the Gibson's Learn & Master Guitar: Standard Edition. Of these three discs, we have found they will play in most computers, but not all. If you are experiencing this issue, please contact our Customer Service department for a replacement of these discs at absolutely no charge to you. We can be reached through email at:service@legacyinstruction.com and by phone at 615-515-3605. If you do not hear back from us within one business day, please try again as we may not have received your message. Thank you! Do you provide more than one way to order? The Payment Plan is designed to make our courses more affordable for our customers by dividing the cost into 3 or 4 payments, depending on the program purchased and the current special being offered. The first payment includes the one time shipping cost, while each subsequent payment will incur a non-refundable surcharge fee of $4 for utilizing the Payment Plan. Each payment after the first payment will be automatically debited from the original card in 30 day increments until the Payment Plan is fulfilled. Can I use the Payment Plan by using PayPal? At this time our system does not support the payment plan while using PayPal. The only methods of payment acceptable for the Payment Plan are Visa or MasterCard. Can I use the Payment Plan on any of your special promotions? The Payment Plan can only be applied to courses that are $100 and over. The Payment Plan cannot be applied to any other promotions, including multiple course discounts. We offer a 60-day Money Back Guarantee. If for any reason a customer is not completely satisfied with our products, we provide a full refund of the cost of the product. We do not refund any shipping costs associated with a returned course. Returned courses must be in like-new condition with no defects, markings, or scratches. If there are any defects, markings, or scratches, the customer will be charged for the defective item(s). Opportunity to Cancel: If a customer orders and decides they don't want the product before the item ships, we will return the entire purchase price (including shipping). Once a return has been approved, the items being returned need to be mailed per the instructions provided by Return Merchandise Authorization detailed instructions. The return ship date for the Item being returned must be within 60 days of the order date. You will be responsible for the return shipment costs for returned items (unless the item is defective or damaged). If you would like to return your Learn & Master product please email or call our customer service department in order to receive a Return Authorization Number before returning your course. You can email us at service@legacyinstruction.com or you can call us at (615) 515-3605 Monday through Friday between the hours of 9:00 and 4:00 CST. Once you have your Return Authorization Number please use the Return Merchandise Authorization Form to return your product to the address provided on the form. We will not accept returns without a Return Authorization Number. All orders typically ship within one business day. We do not ship on Saturday or Sunday. A USPS domestic service used for orders totaling less than 13 oz. in weight, this is an economical option for smaller size and weight items. This service ships by ground (truck), has service days of Monday through Friday, and has a delivery time-frame of up to five business days. A USPS domestic, cost-effective, shipping service used specifically for educational materials, which all courses qualify for on www.learnandmaster.com. This service ships by truck (ground), has service days of Monday through Friday, and has a delivery time-frame of up to eight business days. A FedEx domestic, cost-effective service used for orders shipped within the United States, US outlying islands, PO Boxes, and military APO, FPO and DPO addresses. This particular mail class starts off with FedEx, is transferred to the recipient’s local United States Postal Service (USPS) office, and is then delivered by your local USPS mail carrier. This service ships by truck (ground), has service days of Monday through Saturday, and has a delivery time-frame of up to eight business days. *Note: Alaska, Hawaii, US outlying islands, and military APO, FPO, and DPO addresses may see longer transit times by 1-2 business days. A USPS domestic shipping option used for orders shipped to the non-connected United States, US outlying islands, PO Boxes, and military APO, FPO, and DPO addresses. This service ships by air, has service days of Monday through Saturday, and has a delivery time-frame of up to four business days (NOT guaranteed). A FedEx domestic shipping option used for orders shipped within all 50 United States. This service ships by truck (ground), has transit days of Tuesday through Saturday, and has a delivery time-frame of up to three business days. *Note: Alaska and Hawaii addresses may see longer transit times by 1-2 business days. A FedEx domestic shipping option used for orders shipped within the connected United States. This service ships by truck (ground), has transit days of Monday through Friday, and has a delivery time-frame of up to three business days. A FedEx domestic, expedited shipping option used for orders shipped within all 50 United States. This expedited option ships by air, has transit days of Monday through Friday, and has a guaranteed delivery time-frame of up to two business days. *Note: Select rural Alaska and Hawaii customers may see longer transit times by one business day. A United States Postal Service (USPS) international, cost-effective option used for orders totaling less than four pounds and shipping outside of the United States. This service ships by boat, has transit days of Monday through Friday, and has a delivery time-frame of up to 16 business days. An APC Postal Logistics international shipping option. This particular international option starts off with APC, is transferred to the country’s primary postal service, and is then delivered by the country’s primary postal service. This service ships by boat, has transit days of Monday through Friday, and has a delivery time-frame of up to 12 business days. A FedEx International shipping option, specifically for shipping to Canada. This option is the same as the Ground service above, but has a delivery time frame of up to seven business days. An APC Postal Logistics international, expedited shipping option. This particular international option starts off with APC, and is then transferred to a courier service up to APC’s discretion. This service ships by air, has transit days of Monday through Friday, and has a delivery time frame of up to seven business days. You should have received an email containing a tracking number within one business day of placing your order. If you did not receive one, you may contact Customer Service at 615-515-3605 or email at: service@legacyinstruction.com. Does Legacy Learning Systems ship to P.O. Boxes or Military APO/FPO addresses? Yes, we are able to deliver to P.O. Boxes or Military APO/FPO addresses. Please select the "Standard Shipping" option when placing your order. What are the shipping charges to Canada? Shipping charges to Canada, like the U.S. and elsewhere, vary by the products ordered and the location they are going to. To figure shipping charges on an order, add the products desired to the cart, then enter the postal code and country to calculate the shipping information. From there, the system will provide the available shipping options and costs. For specific details on the different international shipping options, please see the above Shipping Information section. Can I select USPS for shipping to Canada? Yes, you can select Priority Mail International or Priority Mail Express International to ship to Canada as well. We generally don't recommend this, though, as UPS is more reliable and less expensive. What are the shipping charges internationally? International shipping charges vary upon the products ordered and the specific location the order is being shipped. For figuring shipping charges on an order, add the products desired to the cart, then enter the postal code and country to calculate the shipping information. From there, the system will provide the available shipping options and costs. For specific details on the different international shipping options, please see the above Shipping Information section. Can the Guitar Player Pack be shipped to me if I don't live within the USA? Due to the different electrical regulations among countries, and our retail agreement with Epiphone/Gibson, we are not able to ship the Guitar Player packs outside the USA. How long does it usually take to complete a Legacy Learning Systems course? Each course is broken up into several lessons. Each lesson is about 30-45 minutes long. A whole course can take around 1-2 years to complete. This timeframe, though, depends on the individual learner and the amount of practice time that goes into the course. What comes with each course? Each Full Learn & Master course is made up of 3-5 CDs, a 100+ page workbook, 12-20 DVDs (the number of DVDs depends on the course), and access to the Members Only web site that gives you support and encouragement while going through the course. How do I get on the Student Support Forum? Please visit: https://community.learnandmaster.com and register with a username and password. After you complete this process and we approve your profile (usually takes 1 business day), you will be able to access the online support and bonus materials. Please let us know if you experience any trouble with this by contacting Customer Service through email at: service@legacyinstruction.com. Please visit www.learnandmaster.com/resources for the bonus materials. I'm experiencing problems downloading and printing the bonus resource materials. What do I do? The bonus resource material's file sizes are quite large, and can take around 5-10 minutes to download. After you download the appropriate file, we recommend saving the file to your computer before trying to print it. Due to the large file size, most printers will "time-out" and not print the whole file if you try to print directly from the internet before saving the file to your computer. If the file is saved to the computer before printing, then the printer will not "time-out" and the whole bonus resource should print successfully. What is the appropriate starting age for your course? Depending on the student, we typically recommend the starting age to be from around the ages of 10-13 (though the Home School program can be used with younger students around ages 7-9 because of parental involvement). We'd recommend adult facilitation and interaction for any younger learners going through the course, just to help the student stay disciplined and committed to the lessons. What is the difference between the Homeschool Edition and the Regular Edition of the Learn and Master courses? The difference between the Homeschool Edition and Regular Edition of our courses is the inclusion of the Teacher's Resource Materials in the Homeschool Edition. Besides these extra resources, there is no difference between the courses. The Teacher's Resource Materials are comprised of a Teacher's Guide Book and 1 or 2 Teacher's Guide DVD's. Can I purchase the Teacher's Resource Materials separately if I already have a course? YES! You can place an order for the Teacher's Resource Materials by calling Customer Service at: 615-515-3605 during our normal business hours. The Materials are currently $30, plus shipping. How can I contact an author/instructor? Or you can contact them through the appropriate Student Support Forum. Do I get a certificate of completion when I complete the course? At this time, we do not offer a certificate of completion for our courses. We feel that in you using the skills you learned along the way from one of our courses, for whatever purpose intended, is more valuable than any piece of paper we could provide. How you apply what you learn is the reward! What is the difference between the 10 DVD (Standard) and the 20 DVD (Expanded) version of the Gibson's Learn & Master Guitar course? The 10 DVD version includes only the 10 Session DVD's. The 20 DVD version, available exclusively at www.LearnAndMaster.com, contains the 10 Session DVD's and 10 Bonus Workshop DVD's. The 10 Bonus Workshop DVD's include additional songs, exercises, and workshops, where Steve Krenz expands on the session material contained on the 10 Session DVD's, offering additional tips and tricks, and adding plenty of personal encouragement. We've also included a "You're Ready To Move On When..." segment for each workshop so you'll know when you have the skills you need to proceed to the next part of the course. If you have the 10 DVD version, you can buy the upgrade here for only $59 (That's $30 off the retail MSRP, what you would pay in stores). It's worth it! Can Gibson's Learn & Master Guitar be used for a left-handed person? I play guitar right handed so naturally I instruct right handed. I have taught many left hand players and the material is identical. The only difference is that the left handed player has to interpret the visual elements in reverse. This sounds a little more daunting than what it actually is. Left handed players quite naturally make the distinction and capture the material with the same speed and comprehension that the right hand players do. Actually, when the material is presented on video, to a left handed player it will be an exact mirror image of what they will be playing. So, I have not found in my private teaching that left hand students have any problem applying the concepts to their playing any more than right hand students do. Here's another thought. I have found in my personal private teaching that whether a player is left or right handed in their playing is not as cut and dried as "All left hand players play left handed". I have actually found in the course of teaching many left handed people guitar that usually just about half of left hand players actually prefer to play the guitar left handed. As confusing as this would seem. It seems that it has something to do with how "left handed" each individual student seems to be - the level of their handedness dominance. On a beginner, I can usually tell within about two or three weeks how their motor skill development is doing. I generally start every brand new, never touched a guitar before, beginner (right and left handed players) playing the guitar right handed. (I do this for a variety of reasons, the largest being that left handed resources for the guitar are so limited. Almost everything for guitar is geared to playing right handed). For this new left handed beginner, if after three weeks they are still having great difficulty in getting their fingers to find the correct string when fretting a note then I would usually switch them to playing the guitar left handed. I flip the guitar and restring it in reverse or we try to locate them a left-handed instrument. We then start back at the beginning and after about a week of re-acclimating themselves to the instrument it becomes very clear which way is going to be preferable for the student to play. Whether a left handed player should actually play guitar left handed is an issue of motor skill dominance regarding their "handedness". Often this hand dominance is not clear in the first week or two, but by week three it becomes very clear which "hand" is more dominant for these fine motor skill tasks. I wish it were as easy as "If you're left hand, you play guitar left handed" but I have not found it to be that simple. Thanks for letting me be a part of your learning process. My edition of Learn and Master Guitar does not have the Gibson logo. What is the difference between my version and the Gibson version? There are several differences between the older version of Learn and Master Guitar and the newer Gibson's Learn and Master Guitar. Besides gaining the Gibson endorsement, the course was reshot in High Definition (HD), the graphics were updated, and we took out all the "fluff" material from the older course, to name a few changes. So, the Gibson version is basically a "polished" version of the older course. Most customers have found the Gibson version easier to follow and, with it being shot in HD, easier to see what Steve is doing on screen. How do I find, or access, the lesson book for my Spotlight course? Unlike our full Learn and Master courses which come with a physical lesson book, our Spotlight courses come with a digital lesson book in .PDF format. 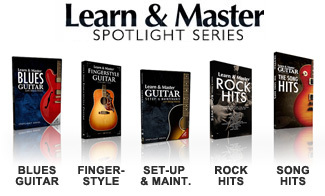 You can access the lesson book for the Spotlight Blues Guitar course on the Bonus Resources section of our website at: www.learnandmaster.com/resources. With the Spotlight Fingerstyle course, you can access it on the disc contained in the kit labeled "Lesson Book and Jam Along Tracks". Please note that when it comes to accessing the Fingerstyle lesson book, the lesson book disc will NOT work in a DVD player designed for a TV. You will only be able to access and download the Fingerstyle lesson book on a computer. What is the difference between the 14 disc and 20 disc version of Learn & Master Piano? The difference between the 14 disc version and 20 disc version of Learn and Master Piano has only to do with the quantity of discs and not the content between the two versions. Each course includes 28 sessions and 28 workshops. In the 14 disc version, the 28 workshops are included within the 28 sessions. In the 20 disc version, the workshops are separated from the session material, thus making 10 discs with session material and 10 discs with workshop material. Besides the sessions and workshops being on separate discs, there are no other differences between the two courses. What is the difference between the 10 DVD (Standard) and the 20 DVD (Expanded) version of the Learn & Master Piano course? The 10 DVD version includes only the 10 Session DVD's. The 20 DVD version, available exclusively at www.LearnAndMaster.com, contains the 10 Session DVD's and 10 Workshop DVD's. The 10 Workshop DVD's include additional songs, exercises, and workshops, where Will Barrow expands on the session material contained on the 10 Session DVD's, offering additional tips and tricks, and adding plenty of personal encouragement. We've also included a "You're Ready To Move On When..." segment for each workshop so you'll know when you have the skills you need to proceed to the next part of the course. If you have the 10 DVD version, you can buy the upgrade here for only $59 (That's $30 off the retail MSRP, what you would pay in stores). It's worth it! Can I use a keyboard for Learn and Master Piano? If so, what type do you recommend? Yes, you can use a keyboard to learn with Learn and Master Piano! Will actually teaches on a keyboard AND a piano within the course. A lot of the techniques applied to piano can also be applied to keyboard as well. When it comes to keyboard selection, there are a VAST amount on the market and it is hard to say what would work best for you, as each keyboard and person is unique to what would work best for them. What we generally recommend is a keyboard that has 88-keys and is weighted. What "weighted" means is the keyboard will have the touch/pressure that imitates a piano. Do I need an 88-key keyboard to learn with Learn and Master Piano? While you may not need an 88-key keyboard at first to progress with Learn and Master Piano, you will find about halfway through the sessions you will need those extra keys the 88-key keyboard provides. Around this point in the course Will goes over bass-line melodies and understanding how to utilize your left hand in playing proficiently, of which requires all 88-keys. I cannot find the painting supply kit for Learn and Master Painting. Do you still offer it?